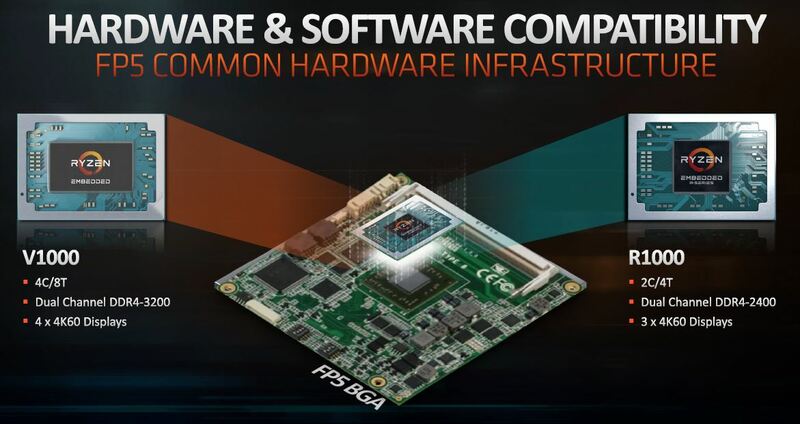 AMD is pushing further into the embedded market with a new SoC family. 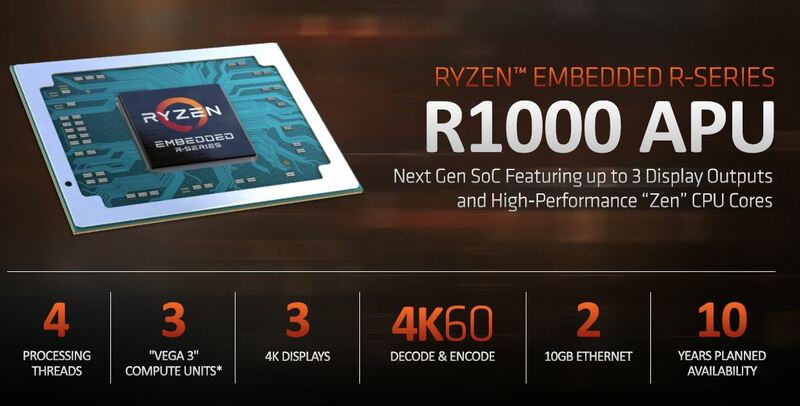 Dubbed the AMD Ryzen Embedded R1000 family, the new SoCs are smaller and lower power than their Ryzen Embedded V1000 cousins, while significantly faster than the previous generation R series. 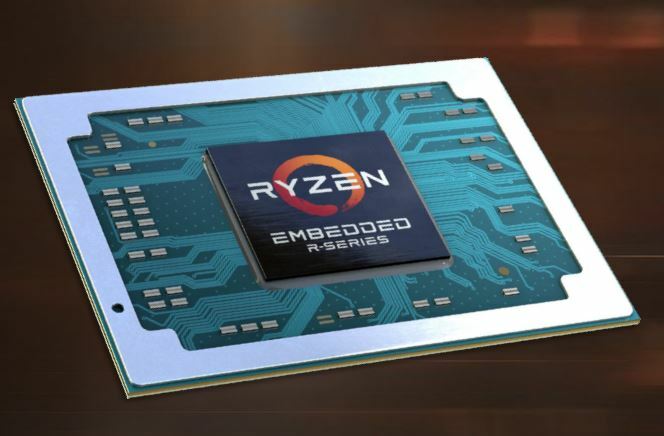 The AMD Ryzen Embedded R1000 series APU replaces the company’s aging Merlin Falcon series with major feature updates. For the embedded market, design cycles and product lifecycles can be much longer than the consumer and mainstream server market. AMD plans a 10-year availability cycle for the new embedded APUs. That includes 2 core/ 4 thread SKUs with three Vega 3 compute units that support up to three 4K60 encode/ decode streams. AMD also has dual 10GbE on the new series. Running at lower clock speeds for 12W (configurable to 25W) operation, the chips can run with heatsinks only in fanless designs. One also gets many of the newer security features that AMD launched with Zen which can be important in this space. DDR4 speeds are only DDR4-2400 compared to speeds of up to DDR4-3200 with the Ryzen Embedded V1000 series. 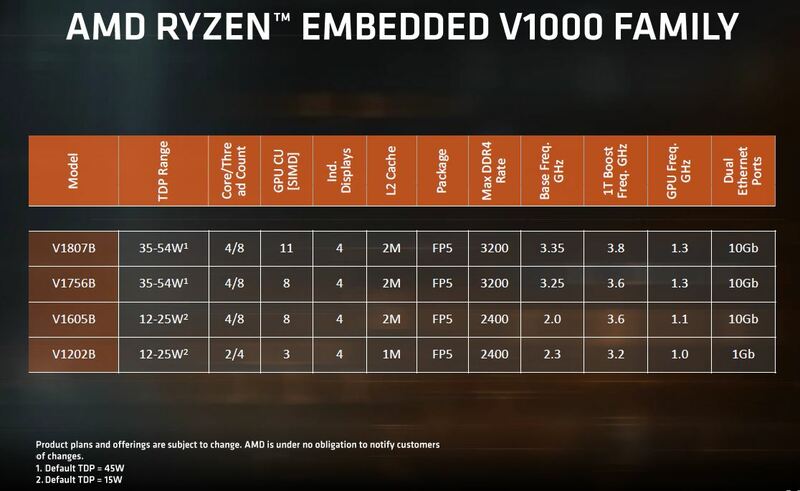 One of the other key factors here is that AMD is maintaining its FP5 BGA form factor for both the Ryzen Embedded R1000 and V1000 APUs. That means customers can design PCB and use either chip to create a broader SKU stack. One will notice that the Ryzen Embedded R1000 die is square while the V1000 die is rectangular like desktop Ryzen die we have seen. Performance wise, we do not love the workloads that AMD is using (Cinebench R15 heavily favors Zen) but AMD’s message is that they are faster. For the embedded space, such as providing CPUs for thin clients or control plane services for network switches, this is a positive development in the market. 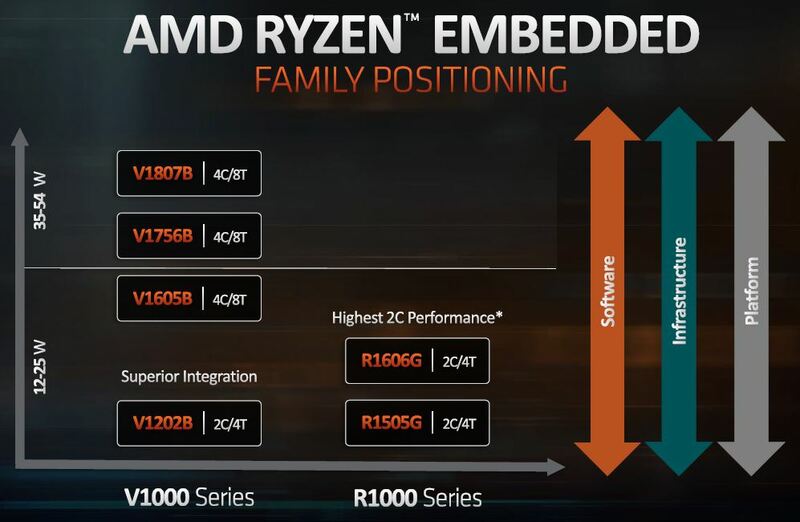 In terms of positioning, the AMD Ryzen Embedded R1000 family has two dual-core SKUs. The primary differentiators are their clock speeds with the R1606 running at higher clocks than the R1505. Customers can configure the APUs within a 12-25W range. One will notice that a big feature for the V1000 series is supporting up to four displays instead of three on the R1000 series. In the lower TDP range, the AMD Ryzen Embedded V1605B is still very intriguing with twice as many cores, threads, cache, and more GPU power. Still, one can see the differentiation points of each of the SKUs. We are told that these come in at $100 for the AMD Ryzen Embedded R1606G and $80 for the Ryzen Embedded R1505G. This pushes AMD into a few new segments. For those devices that need lower power parts, the AMD Ryzen Embedded R1000 line offers a new solution. 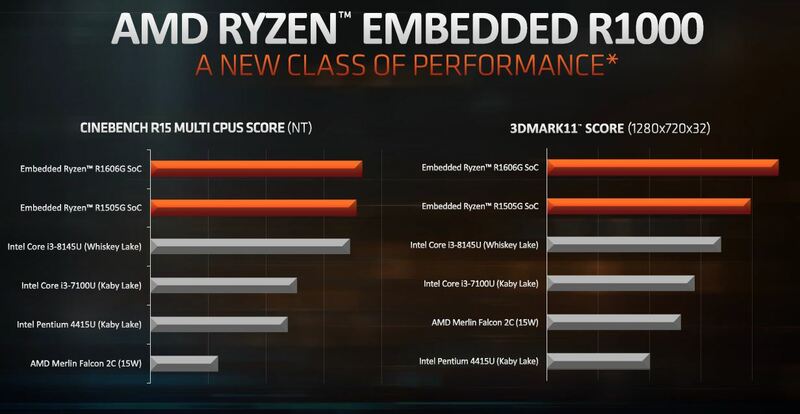 When compared to the Intel competition, there is no real direct comparison. 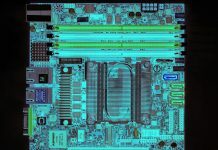 The Intel Xeon D-2100 series is a higher power part. The new Intel Xeon D-1600 family is based on an older Xeon core (Broadwell-DE) and does not have an onboard GPU for video, but has 10GbE. The Atom C3000 series plays in this TDP range but again lacks a GPU. Embedded Core lines for Intel do not have integrated 10GbE. 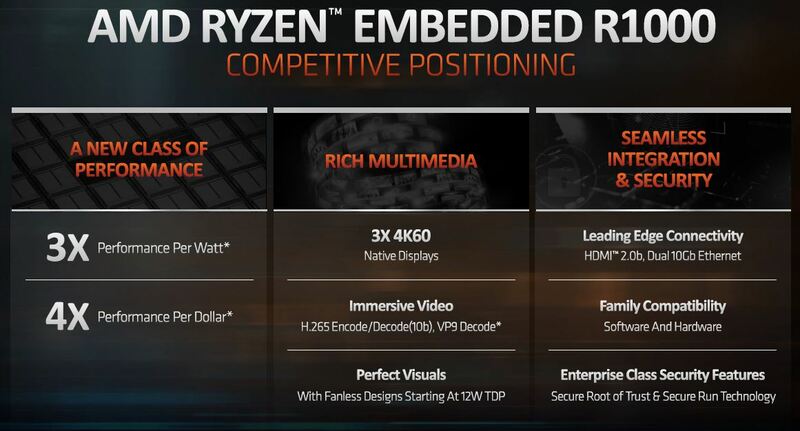 This means that AMD Ryzen Embedded R1000 has features that its competition does not have a direct answer for. 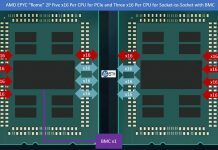 Still, AMD is gaining momentum in the embedded space again, and designs like these are likely to help AMD get additional market share in the coming years. It’s very nice. Now could we *please* have 10GbE on the consumer platform? You know, the one that costs a lot more than these things? The First thing that I want to Know about any new CPU/APU SKU is what is the provess node used to fab the part. So that’s definitely the reporter’s job to ask and even if they do not get a responce just state unknown. Seriously who cares about fab process? It has performance and power specs. We use embedded CPUs and that’s what we care about. Fab process just lets numbers be better but we’re making decisions on performance specs of the part. Does anyone even use 10gb on a chip with this performance level? I’m not complaining mind you, having any integrated nic(s) is a bonus, and likely implementing 10g is the same effort as 1gb from a phy standpoint. I don’t use these but can imagine deploying them as VDI clients, or kiosk displays…neither of which are likely to have 10g switches backing them….though I guess if you are pushing triple 4k displays on VDI you want 10g to feed that. Matt – I believe the use case is in switch control planes where there can be 10GbE internal links available. You missed Intel’s Atom Embedded chips, those have integrated GPUs also. In the upcoming days you will notice AMD’s usual supply problems of their embedded chips, just like what happened to their previous V1000 series chips. As the time of this comment, Udoo Bolt hasn’t shipped yet! From missing December last year and to end of last month, none have been seen outside of Udoo.